Radolfzell, February 2014. Columbia – a country which brings to mind coffee, colonial times, dance and exuberance. This feeling is reflected in the architecture of the “Titán Plaza”, a shopping center designed by the architects Tamayo Montilla Arquitectos. It is a wide open building offering plenty of space, ready for meeting up and celebrating, as if made for the pulsing life of Bogotá. The three storey shopping center is conveniently sited for traffic at the intersection of two main roads in the Columbian capital. The facade which is made up of a lively series of trapeze-shaped opaque and transparent surfaces affords views toward the inside and outside at the same time. This creates a unique tension which continues inside the differently dimensioned and shaped atria. Shops are grouped around the busy internal courtyards which are themed around the colors of flora, fauna, foliage and fruit, bringing nature inside. The outside is also drawn in by the membrane foil canopies which repeat the opaque-transparent alternation of the facade – and regularly give a view of the sky. Their basic layouts range from circular to crescent shaped and even an elongated main dome which arches above the 109 m long central hall. 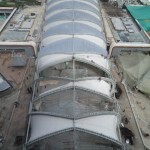 The theme of the main roof is also found in the rhythmic alternation of ETFE cushions and mechanically tensioned membrane. Apart from the four smallest oval roofs, all other roofs follow this design principle. 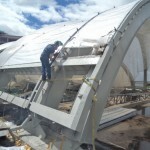 Steel arches form the substructure. 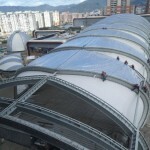 Whilst the transparent ETFE cushions are fixed above the steel arches, the opaque membranes connect at the sides and are tensioned by wind suction cables. 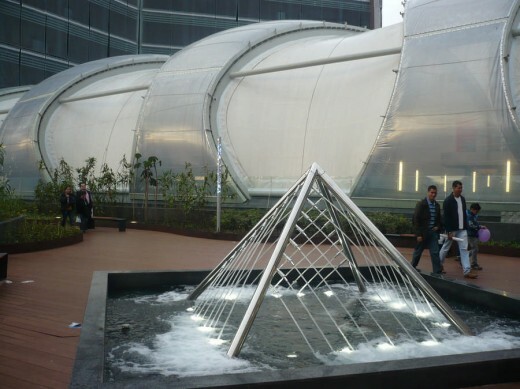 This creates undulating roof surfaces. 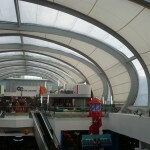 The way in which the ETFE cushions are supported leaves slots at the sides so that the atria benefit from a natural exchange of fresh air. The resultant atmosphere gives you the feeling of walking in the open air but you are protected from the climate, it is whether rain or excessive sunshine. The dot printing on the cushions reduces the incidence of light and heat additionally. Columbia, the land of differing climate zones, has quite special weather conditions which include heavy hail showers. For this reason the building envelopes have been designed to withstand hail loads of 100 kg/m². 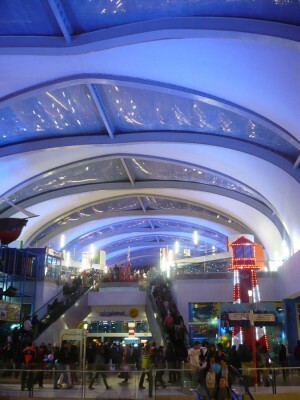 Inside like outside, the Titán Plaza presents an image of vitality and lightness. Despite its simple appearance, the project required complex analysis and execution design. 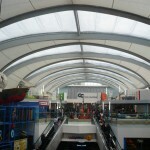 The membrane fabricator therefore called in the specialists of formTL. The team of experts from Radolfzell prides itself in rendering architectural visions possible. In an interactive process with the architects, sketches and ideas result in the creation of technically refined foil and membrane constructions. 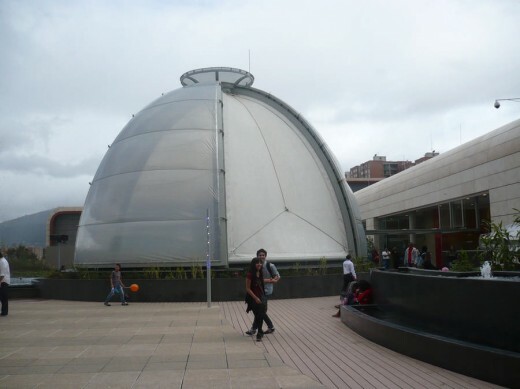 In Bogotá, the engineers performed the structural analysis and produced the cutting patterns for the foil and cushions of all the membrane roofs. The main dome presented a particular challenge as it is not based on classical arch geometry and its ground plan widens out towards the back. Moreover, the base of the roof rises upwards by one storey at the center of the dome – a step which is bridged in a visually elegant fashion. The team from formTL initially modified the architects’ drafts into practicable arch segments. 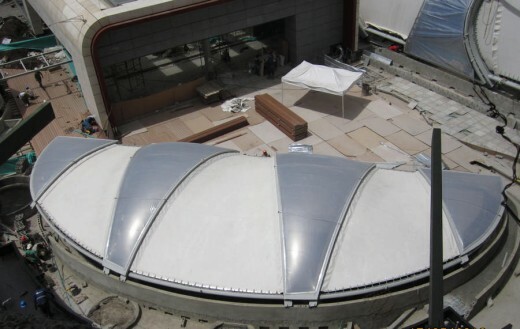 Because of the geometry in the main dome, no single steel arch is identical to any other and there are very few membrane and cushion cutting patterns which are identical. The supply of air to the cushions posed a further challenge. formTL managed to reduce the number of blower units to two. 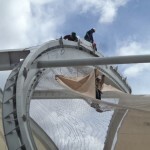 This entailed choosing the tube cross-sections so that even in the case of cushions located 100 m from the blower unit the air is at the same pressure as the first ETFE cushion in the series. The years of experience gained by formTL once again brought positive benefits at the execution stage because the construction tolerances of the steel structure were exceeded by 20 cm and more. At this point the deadline for the opening was coming closer. To keep to the deadline, the engineers at formTL devised a flexible solution to ensure the previously manufactured cushions did not have to be redone. For this they modified the connection details and varied the camber of the cushions. Depending on requirements, these were made flatter and therefore slightly longer or more bulging and therefore shorter. The observer is unable to spot these differences and so the buildings retain their elegant and light overall appearance. The textile atrium roofs with their lightweight materials fit in with the fundamental concept of the structure which requires a constant alternation of the interior and exterior. Opaque surfaces alternating with transparent surfaces raise the tension and ensure there are always new viewing aspects. By day, the membranes offer a view of the sky and bring to the inside what is happening outside. 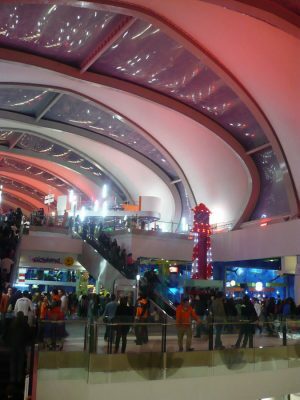 At night the effect is reversed: plays of light lend the foils different colorations and the membrane cushions grant insight into the happenings inside the Titán Plaza.